Seriously- stay with me on this one. I know it sounds outrageous and you want to turn your nose up at the idea. You’re thinking “Gingersnaps don’t belong in beef stew. Or any stew for that matter.” But if you refuse to be at least a little adventurous and humor me on this you will miss out on perhaps the best beef stew EVER. The flavor is complex and rich- infinitely more involved than just meat and vegetables in gravy. It’s what I’ve always wanted my beef stew to be but have never managed to turn it into. I do have to admit that the original idea isn’t mine. It all started here with Carbonnade a la Flamande, a traditional dish from Flanders (the Northern European area that encompasses France, Belgium, and Holland). 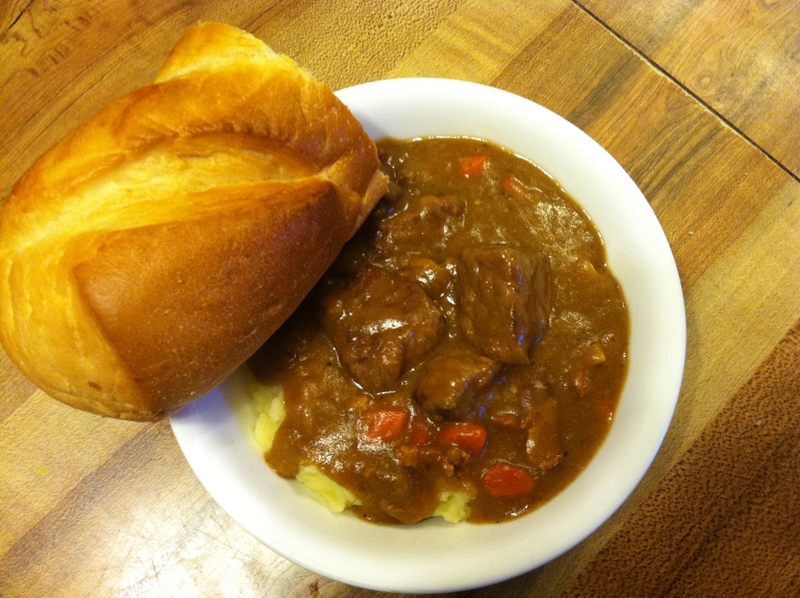 Carbonnade a la Flamande is said to be a hangover cure because it’s made with ale. I wouldn’t know. I don’t get hangovers. Partly because I don’t drink very often. And when I do I don’t drink to excess. But the times in my life that I have “tied one on”, I haven’t gotten a hangover. Called me blessed, I suppose. Anyway… The recipe calls for a significant amount of ale. I didn’t want to spend the cash, honestly. With my husband out of work at the moment we don’t have the extra cash to spend. So I changed the recipe. I turned this into a traditional beef stew with a secret ingredient instead of Carbonnade a la Flamande. I may never make beef stew any other way. It’s that good! Note that there is no obvious thickening agent for this stew. 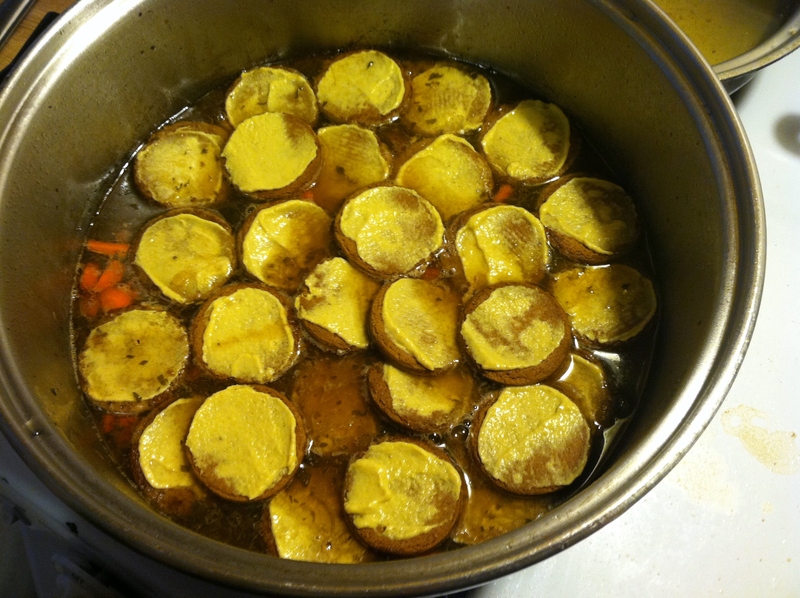 The reason for that is simple: the gingersnaps thicken the stew. The above link says to add the gingersnaps when the stew starts boiling. I found that to be a mistake. I’ll go into why a bit later. But the gingersnaps really are all you need to make this stew unbelievably thick. You would have to add A LOT of cornstarch or roux to make it as thick as the gingersnaps make it. Let’s get started! Dice the carrots, slice the onion and garlic, and then mince the thyme (if you’re using freshly cut off of your own plant like I do- the stems are so small and green that I can just use them along with the leaves. If you’re using store bought fresh thyme with woodier stems, scrape the leaves off and discard the stems). Wash your cutting board so you don’t cross contaminate, and then dice the bacon and deal with the meat if need be. You can use stew meat for this but I seem to have a knack for finding stew meat that looks great on the surface but under that is the fattiest, most gristly meat ever butchered. So I play it safe and buy an inexpensive roast or steak. In this case, a bottom round roast. If you’re using stew meat just leave it as is. If you’re using steak or roast, cut it into 1 inch chunks. Cook the bacon over medium low heat to render it completely. Once it starts to get crisp remove it from the pan using a slotted spoon and set it aside- keep the drippings in the pan. Brown the meat in the bacon drippings over medium high heat in batches (don’t cook it all the way through- you just want to sear the outside), taking care to not crowd the pan. You want the meat to sear- not boil in it’s own juices. 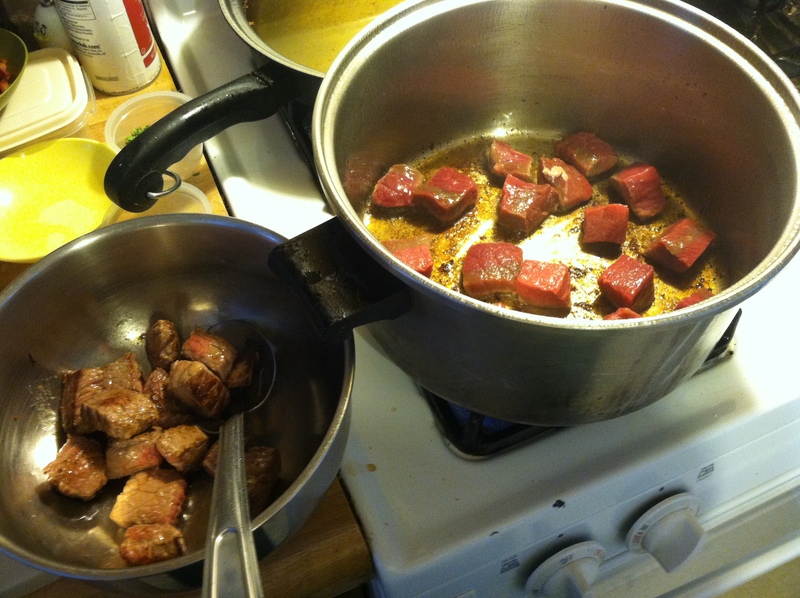 Remove each batch of beef to a bowl and set it aside. If you don’t want to use bacon you can use olive oil to brown the beef. But the bacon adds a wonderful flavor and a touch of smokiness- I never miss a chance to use bacon for things like this! After you get all of the meat browned and removed to a bowl, add the onions and saute over medium heat until soft. At that point add the garlic and cook for a few minutes; until it’s soft and fragrant. Once you’ve achieved that, pour in the beef stock to deglaze the pan. Add the beef (along with any juices accumulated in the bowl) and the herbs and cook for… well, that depends on what cut you used. If you used stew meat you’ll want to let it simmer for at least 2 hours. Three wouldn’t be a bad idea. If you used round steak or roast you should only need about an hour to an hour & a half. Just be sure to keep an eye on the liquid level- it should always be covering the beef & onions by about half an inch. If you need to you can add some water to the pot to keep the proper level. Don’t worry about making it bland. The beef will give the water plenty of flavor. Turn each cookie over and smear the bottom with a thin layer of Dijon mustard. 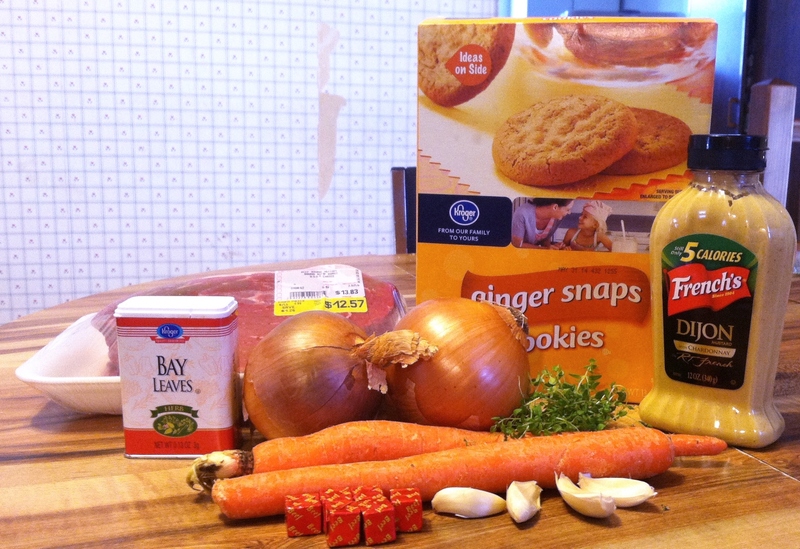 BEFORE YOU ADD THE COOKIES, put the carrots into the stew. You don’t want them to be mush so don’t add them before now. So stir the carrots in and then add the cookies in somewhat of a layer to the pot. They may not ALL be in one single layer- that’s ok. Just float them on top. Bring the stew back up to a simmer and put the cover back on. Let simmer for about 10 minutes and then start stirring the cookies into the stew. It may take a little effort but they will dissolve and thicken the stew. 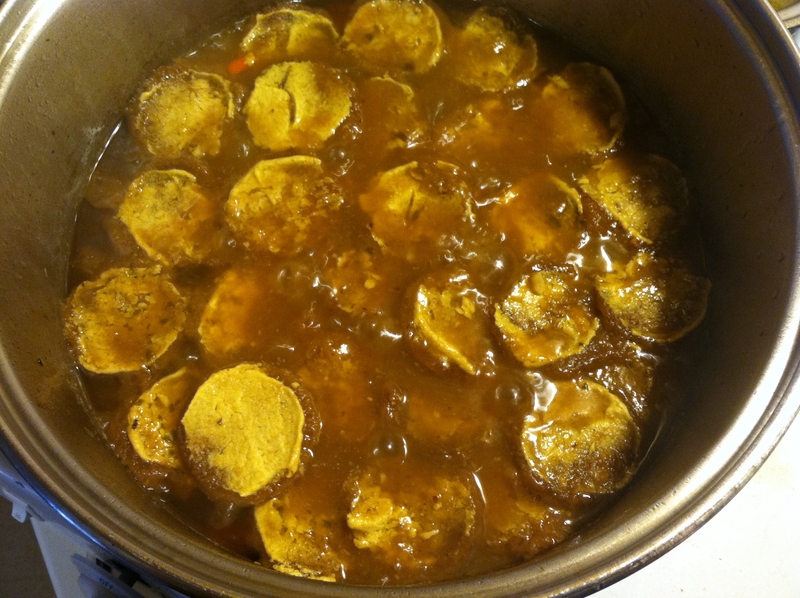 Simmer with the cover on until the cookies are completely dissolved and the stew is as thick as desired. You’ll need to stir the pot fairly often now, as once the cookies dissolve it’s the stew’s fondest wish to stick to the bottom of the pot. Once the stew is finished cooking, don’t forget to fish out the bay leaf- you don’t want to eat that. In fact, the bay leaf may very well cut your tongue if you try to eat it. Then check for seasoning and add salt & pepper to your liking. This stew really is amazing; it’s rich and savory with a hint of spice & a tiny bit of sweetness from the cookies. You can add just about anything you want in the way of veggies, too. Sometimes I add peas as well as carrots. And sometimes mushrooms are a very welcome addition. If you want to add mushrooms I suggest portobellos for their meatiness and ability to hold up to boiling. You will need to saute them along with the onions. I served this batch over homemade mashed potatoes, but traditionally carbonnade is served over egg noodles so if you prefer, you can serve it that way. But I think my absolute favorite way to eat this stew is by itself in a bowl with a hunk of warm, crusty bread. Mmmmmm…. *Slice the onions and garlic, dice the carrots, and mince the thyme (put them into separate bowls). *Cut up the meat if need be. *In a large soup pot, cook the bacon over medium low heat until completely rendered and crisp. Remove with a slotted spoon to a bowl. Do not drain the drippings. *In batches, sear the meat in the bacon drippings over medium high heat. As each batch is done remove it to a bowl. *Add the onions to the pot and saute them over medium heat until soft. *Add the sliced garlic and cook for 2 minutes- until soft and fragrant. *Pour the beef broth into the pot to deglaze. *Add the beef and it’s drippings and the bacon back into the pot. *Add the herbs to the pot. 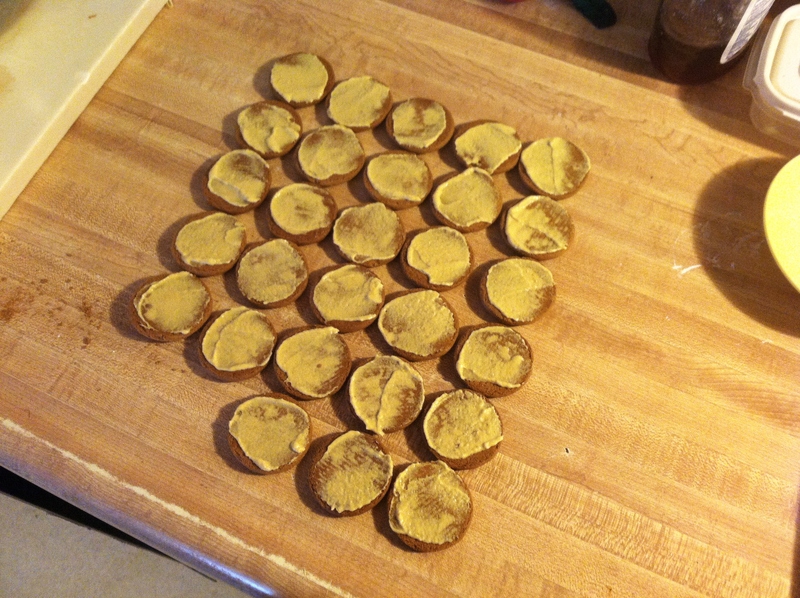 *Spread the bottoms of the gingersnaps with a thin layer of Dijon mustard. *Add the carrots to the pot. *Float the cookies on top of the broth. *Simmer, covered, for 10 minutes and then break up the cookies by stirring. *Simmer, stirring often, until the cookies are completely dissolved and the stew is as thick as you’d like it to be. *Fish out the bay leaf (this can also be done right before you add the cookies- sometimes it’s easier to find when the stew isn’t thick) and discard. *Taste to check seasoning and add salt and pepper to taste. *Serve over mashed potatoes, egg noodles, or just on it’s own. This doesn’t mention how many onions, so I’m guessing two. I’m making this for guests, so I’m okay with splurging. Does it taste just as good if I use Ale, or is beef broth better? I love how detailed your instructions are. Thanks! Hi Leanna! Thank you for stopping by- and leaving a comment! You are right; I forgot to list how many onions in the recipe section. Yikes! It is, indeed, 2. I fixed the recipe once you pointed that out. Thanks! You can certainly use ale. It changes the flavor of the dish but it’s still very good. If you do use ale, you’ll need to add 2 tablespoons of apple cider vinegar to balance the flavors out. I prefer the beef broth version, but both are sooo good! I do try to give super detailed instructions. Cooking can be a daunting process if you don’t have concise instructions. So I am as detailed as I can be to take some of the intimidation out of the whole thing 🙂 I hope you come back and visit me again soon!